Crag dice game is contemporary of another sequence dice-casting game Yacht. Yacht is played with 5 six-sided dice whereas Crag is played with 3 six-sided dice. Other popular games with similar game play include Yahtzee, Yatzy etc. The objective of the game is to score points by rolling 3 six-sided dice and making certain combinations. 3 six-sided dice and a scoresheet. 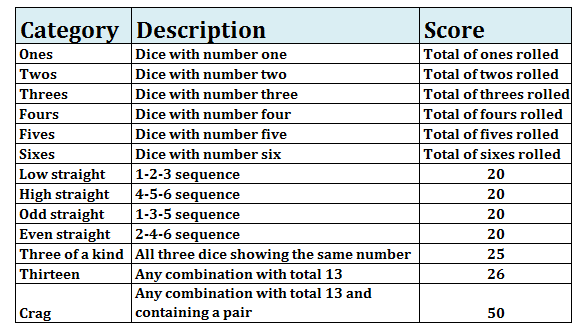 Crag dice game has a quicker game play compared to other similar games such as Yahtzee or Yatzy since Crag is played with only 3 dice and it has just one re-roll allowed. The game has 13 categories to score and each category can be scored only once. Categories can be scored in any sequence. In each round all players take turn to roll 3 dice. Player can again re-roll all or some dice one more time. More than 2 rolls are not allowed. Player can choose a category to play even if he/she scores zero in it according to the scoring rules. Once all categories are played, the player with the highest points wins.